If you are looking for the one CD for this incredible and historic weapon, you will want the information this CD and Download contains. You will recieve complete production and serial number listing from 1912 to 1981 are listed on this CD, plus you'll have the records of military production and commercial production with information on who made the weapons, military branch, how many and dates of manufacture. Complete disassembly and schematics with parts names and pictures. The difference between the M1911 and the M1911A1 are spelled out. 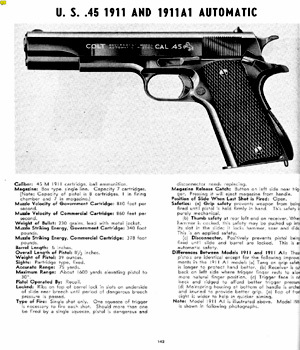 The Theory of Operation Colt .45 ACP Government Model Pistol - explains just exactly how this wonderful weapon functions. 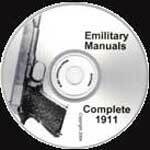 You also get no less than 5 complete maintenance and repair manuals with all the instructions you will need to take care of your 1911. An added bonus is the story of The American Expeditionary Forces and the 1911 Automatic Pistol.